Prosecution and litigation are two central columns supporting the business of protecting trademark rights in the United States. The first of those pillars has undergone a significant change in recent months, while the second remains as complex as ever. In this three-part special, WTR examines and provides guidance on the latest developments at the US Patent and Trademark Office (USPTO) and the federal courts. 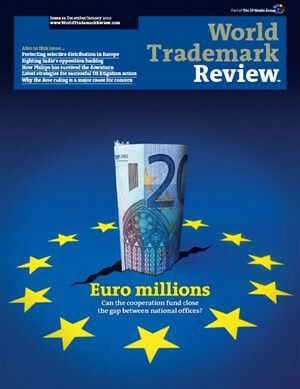 Turmoil in the world economy continues to affect the trademark industry, with organizations slashing costs in a bid to weather the storm. The Internet Corporation for Assigned Names and Numbers (ICANN) has come under fire from brand owners over its handling of the trademark protection policy for the expanded generic top-level domain (gTLD) space developed by the Implementation Recommendation Team (IRT). The protection framework in China continues to develop with the China Trademark Office bringing into force the Regulation on Issues in Relation to Trademark Assignments. Trademark managementGenericide or clever marketing? The pace of change on the Internet means that a mark could potentially become generic within a matter of months. But is the use of a mark as a verb, so often the first step to ‘genericide’ in the past, now really such a bad thing? Is it time to allow marks “to verb up”? A boom in advertising over the past 10 years is reflected in the development of related legislation. However, there is limited case law from the courts in this field due to the significant enforcement powers of regulatory bodies. Russian advertising law is not extensive and can be ambiguous, but an analysis of recent cases reveals that the legislation is, for the most part, interpreted intuitively. The ECJ’s decision in the O2 Case has clarified key issues unique to Benelux. However, inconsistencies in approach are still apparent. In a landmark decision, the High Court of Madras has attempted to tighten the rules on comparative advertising. However, the ruling may have opened the door to inconsistency in the interpretation of the law in this area. A recent high-profile marketing initiative by a Mexican pharmaceutical company appears to be a clear example of unfair competition. This article puts the campaign in context and looks at the likely outcome for the advertiser. While a fully joined-up European advertising policy remains a dream, at least the Danish system has been updated to provide comprehensive coverage. Moreover, individuals have a strong ally against unfair advertising in the shape of the Consumer Ombudsman. Is the online use of a third-party mark to link through to competitor products lawful? Case history in Israel to date shows an increasing leniency towards this activity - Oren Mandler and Kfir Luzzatto analyze the reasons why. Advertisers must take into consideration provisions of the Consumer Code and Legislative Decree 145/2007 when devising a marketing campaign. Any breach of the rules could lead to the advertisement being suspended and a fine. Often the best way to make a product stand out is to compare it to competing products on the market. However, while powerful, comparative advertising treads a fine legal line between good business and unfair competition. Norwegian law offers several means of enforcement against unfair and comparative advertising. This article analyzes the options available and provides an overview of recent amendments to the Marketing Control Act. Brazil’s new fondness for comparative ads has highlighted ambiguities in the legal regime in this area. However, there is considerably more certainty over ambush marketing: the country’s selection as host of the 2014 World Cup and the 2016 Olympics have already prompted bills on the subject. Facebook is bringing in new privacy measures in response to criticism in Canada over its handling of personal data. The new approach looks likely to have an impact on mark owners' advertising strategies. The legislation on unfair and comparative advertising has its roots in the rules on unfair competition. The introduction of changes to the Advertising Code in 1998 clarified the law by implementing the EU Comparative Advertising Directive. The sprawling legislative regime governing advertising, along with a fragmented administrative system, means that practitioners must stay on their toes when trying to determine whether an advertisement is permitted in Spain.